Enjoy the rich flavors of fall year-round. 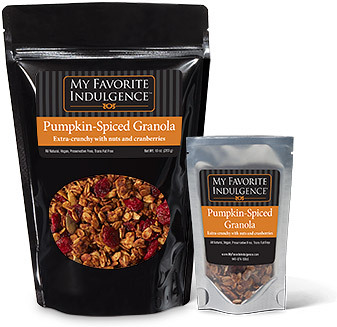 This granola gets its unique taste from real pumpkin and a special blend of spices, including cinnamon, ginger and nutmeg. To top it all off, you'll find a generous amount of dried cranberries in every pouch. Learn more about Gift Wrapping. Salt  Ginger  Nutmeg.